First off, I want to thank Monsignor Farrell head coach Tony Garofola, Iona prep head coach Joe Spagnola, Tottenville head coach Brian Neville and South Shore head coach Mike Ciquera for the open door access they gave me to their staffs, facilities, and sidelines. So…….it was a tough weekend for my NYC Opinion Poll as well as my fellow Staten Islanders. On Friday, in Brooklyn, I watched my No. 2 team, the Tottenville Pirates, lose a thrilling game to my No. 3 team the Vikings of South Shore 33 – 28. On Saturday, I was on-hand as my former team the St. Peters Eagles lost to Xavier of Manhattan at home, 13 – 7. Finally, on Saturday night, I watched my No. 1 ranked NYC team, the Monsignor Farrell Lions, run into a buzzsaw, the Iona Prep Gaels of New Rochelle, who were ranked No. 2 in the High School Football America New York Top (statewide rankings). Farrell lost at home in front of a packed house, 49 -14. I must admit, the High School Football America poll had it right using Jeff Fisher’s algorithm which had Iona over Farrell, South Shore over Tottenville, and, in the other big NYC game, Cardinal Hayes over Christ the King! Both Farrell and Tottenville faced similar situations defensively from a technical aspect. The 7- and 8-man boxes were a challenge for both teams offensively. Tottenville was winning their matchups on the perimeter, but their QB and O-Line struggled facing constant pressure and disruption. Farrell was unable to get anything going offensively and couldn’t keep pace with the high powered Iona offense. On Friday night, the story of the first half I noticed was coverage issues for both teams that their opponent was unable to take advantage of. Struggling to find offensive success the first quarter ended 0 – 0. Early in the game Tottenville’s inverted slot-motion was confusing South Shore and getting guys to run free against man coverage, but they were unable to connect due to the constant pressure of South Shore’s Front Four. Mike Jones started the scoring in the second quarter after a few great runs by Roland Dempster, who later scored himself in the middle of the second quarter on a highlight reel run. Trailing 14 – 0 and facing a very heavy box from Tottenville, South Shore had to do something to loosen up the Pirates and they did just that. passing threat is taking quick vertical shots. After overthrowing a wide open WR on Tottenville’s blown coverage, South Shore QB Darius Thompson came right back to it and connected for a TD pass cutting the lead to 14 – 6. However, Tottenville capitalized on a coverage issue of their own, hitting Mike Jones for a 68 yard TD and his second TD of the night. It looked like the seem/slant combo from the No. 3 WR in Trips would be an issue for South Shore all night, but Tottenville was only able to capitalize one time. Prior to the half, Thompson had two more legitimate guys behind coverage and failed to connect with both. South Shore was able to get their running back straight through the line to split the two high safeties and they failed to connect on my least favorite 7 on 7 route of all time. I always say that route would never happen in a game. I was wrong and I was surprised that South Shore didn’t come back to that route. The half ended with the Tottenville leading 20 – 6. I felt both teams were lucky they didn’t give up more. The second half started off as wild as the first half ended with the Pirates on offense. On the first series, the Pirates center snapped the ball while the QB was looking at the sideline and it was scooped up by South Shore. However, the ref blew the whistle immediately on the snap and they called it a false start….which was baffling to me. Again Mike Jones was wide open from the No. 3 spot in trips and again Tottenville was unable to connect. Tottenville was forced to punt and thats when NYC Football was introduced to freshman phenom Zuberi Mobley. He and Thompson put on a show. After a few highlight runs he scored his first TD of the night cutting the lead to 20 – 13. At half time, South Shore clearly decided what the plan of attack would be and Tottenville struggled to counter what South Shore was doing on both sides of the ball. On offense, the Vikings were using formations and spacing on the hash to get the lightning quick Thompson and Mobley to the edge. On defense they were running a 6 – 1, disrupting both Tottenville’s run game and pass protections. Pirates were still getting open against the man coverage, but they were unable to connect. After trading punts, Tottenville got a well-designed completion to Dempster out of the back field to get the ball to midfield…but, the drive stalled again. The Pirate punter fumbled the snap and was tackled in Pirate territory on 4th down. A few minutes later Thompson scored on a nifty 17-yard run tying the game at 20 to end the third quarter. Entering the fourth quarter, I was hoping to see Tottenville run some sort of secondary blitz from the wide-side to disrupt the flow South Shore had going on offense and reclaim the momentum. South Shore was also matching Tottenville’s two-back sets with a very heavy box, daring the Pirates to throw. Midway through the fourth quarter, the dynamic Thompson scored again giving South Shore the lead at 27-20 after 21 unanswered points. I knew if Tottenville was going to win they would have to make a big pass play. They did just that when Kolubah Peewee, Jr. took a short hitch, breaking several tackles for a 45 yard TD pass with a ton of YAC. On the road and in a hostile environment late 4th quarter, Tottenville did my favorite thing and went for and got the 2-point conversion to take the lead at 28 – 27. With less than two minutes to play, Tottenville got South Shore finally into a 3rd and long between the hashes and I knew it might be over for the Vikings. Drop back set passes are not really Tottenville’s thing on offense. With what turned out to be the unlucky play of the day for the Pirates, they got to Thompson and to credit his elusiveness, there was a face mask call on what would have been a game ending sack. It was absolutely a face mask and that was unfortunate, but it was demoralizing for the Pirates. A few seconds later Thompson broke off one of the craziest runs I have ever seen, making several guys miss than carrying those still standing into the end zone for a game-winning TD and 33 – 28 victory. Thompson finished with 14 runs for 150 yds and 3 TD’s. Mobley had 24 carries for 305 yds and a TD in the best performance I’ve ever seen for a freshman. With a few adjustments and a little more luck on their side I am sure Tottenville can knock off this talented South Shore team in a playoff rematch. Farrell had a glimmer of hope on Iona’s opening possession forcing the first appearance of Iona’s punter I had ever seen. 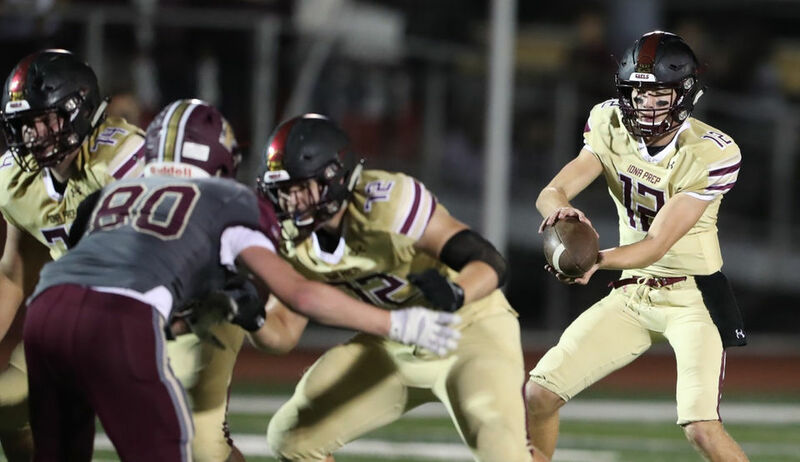 After trading a three-and-out, Iona drove the field, but Frankie McFadden fumbled stretching for the goal line giving Farrell the ball at their own 20. A few nice runs by Farrell QB Mike Regan and a 40 yard connection with WR Christian Tate, set up a wild goal line TD, where Regan was wrapped-up and he threw it up desperately finding Vincent Renna in the front of the end zone to give Farrell a 7-0 lead. However, that would be the lone bright spot for Farrell. Iona was not forced to punt again and the machine began to roll. In my pregame points, I noted the things Farrell would need to do to win. There were three key points and they lost in all three of those aspects. First, I felt that Farrell needed to somehow keep Iona around 60 snaps. Iona had 80 plays and it would have been more, but they were scoring on big plays, limiting drives to five or six plays. Secondly, although Coach Spagnola wouldn’t confirm it before the game, I assumed they would give Farrell a heavy box and be four-on-four on the perimeter and my assumption was correct. It looked like Iona gave a mix of Cover 0 and Loose 2, but either way it was my four versus your four and Iona won that. Farrell’s top WR, junior Christian Tait, was going to have to dominant Iona’s junior corner, Jordan Dunbar, forcing Iona to provide some coverage help if Farrell was going to have a chance to run the ball, and they were unable to do that. I noted that someone else aside from Farrell RB Vin Wagner would have to carry the offensive load and on the opening drive Tait caught a 40 yard pass and Regan had several good runs giving the game plan a glimmer of hope. However that was it for the game. Dunbar, a D1 prospect who already has an offer from Florida Atlantic, dominated the matchup, limiting Tait to five catches for 22 yards after that first 40 yard completion. Dunbar had several key plays on the perimeter, including a tip that led to an interception deep in Farrell territory essentially putting the nail in the coffin. Wagner barely found an inch all game carrying 16 times for 53 yards. So the final key to Farrell winning was someone other than Wagner carrying the offensive load and that didn’t happen. Yikes. Loaded with Division 1 talent; extremely well-coached; and a scheme that would give a less talented team a chance to beat anyone, is flat out SCARY. A massive, agile, and nasty offensive line paves the way for an absolute arsenal of skill players. Photo courtesy of Derek Alvez of Staten Island Advance. The offense is led by record-setting QB Derek Robertson, who should have ten Division 1 offers by now, but I guess he doesn’t have the correct 40 time or something along those lines. I assume that he fails the eye test when you look at him, but he doesn’t fail the eye test when you watch how he plays the QB position. Quick decision-making and accurate throws come out of a rocket arm with precision and timing. For my college coach friends, from a technical aspect, he can hit the first down sticks on the left sideline from the right hash routinely with perfect timing, easily. If college coaches actually still went to high school games they would find these hidden gems like Derek. He is better than the quarterback at Wagner College, right now. I’m not sure what college coaches are looking for. Perhaps, this is why there is such a constant carousel of new coaches recruiting our area, no one seems to know how to recruit. Derek tops my list of local kids that would have multiple offers, if we lived in Texas, but I’m saving that for a story down the road! Derek does not break records on his own. Iona seems to have multiple D1-level options at all of their skill positions. Robertson finished 22 of 31 with two TDs. 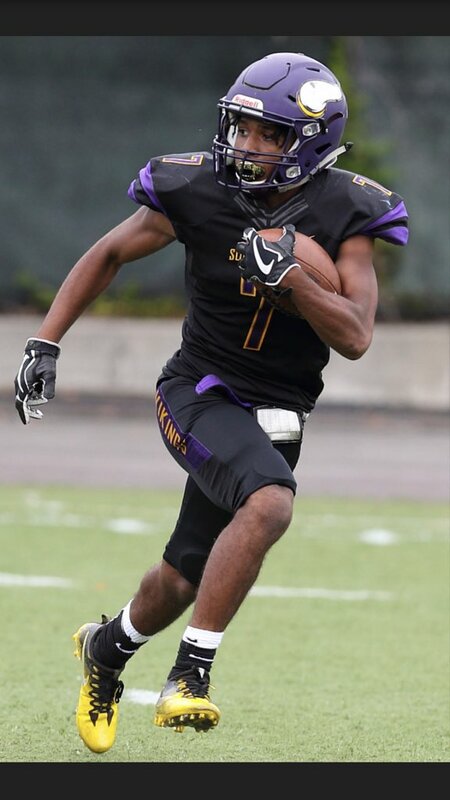 Sophomore Frank McFadden (17 carries for 145 and 3 TD’s), Camari Glasgow (8 carries for 108 and 2 TDs), and Matt Panker (caught 8 passes for 76 yards and TD) are literally a sample of the Iona skill positions. The best looking prospect on the field is Sean Fleming is 6’4, 230 pound Tight End (7 for 53) is a punishing blocker, who is verbally committed to Monmouth and no knock on Monmouth, but again if we lived in Texas, he would be going to Michigan…again, a story for another day. The final score was 49 – 14 in front of a packed house on Staten Island. I am glad that I am no longer coaching defense because aside from having much better talent than Iona or praying that they have a bad day, there is no stopping that machine when it gets rolling. Unlike Tottenville, I have no clue or suggestion as to what Farrell could do in the playoffs differently to stop Iona. I would just pray they have a bad day. Watching Iona makes me glad I’m not coaching. It’s a considerable mismatch. The gap between Iona and Farrell is as wide as the gap between Farrell and lower level AA to A team. Iona is a ridiculously good team. They may have been better than Farrell at all 22 positions. You could combine the other teams I saw this weekend, Tottenville, South Shore, STP, Xavier, and Farrell into an all star team and they would struggle to beat Iona and match up physically. The disparity is that large. Now anything can happen with high school kids, but when Iona plays like they did Saturday night? No one can beat them. Iona reminds me of the 03’ St Anthony’s team and 15’ Stepinac squad. Now the real dilemma is do I drop Farrell from my #1 team in NYC because they lost to a powerhouse from outside NYC? I certainly know what other pollsters would do and thats why I am here to change the game. Finally, two things Im super excited to see next week. Chaminade (AAA) hosts Kellenberg (AA) after the Flyers biggest win in years over Stepinac on Saturday. Kellenberg is literally barreling through their outmatched AA opponents outscoring them 198 – 48. This clash on Long Island will go a long way for deciding how the NYCHSFL seeds teams and creates divisions. I’m calling it now…Upset of the Week is going to be the defending champion Curtis Warriors knocking off South Shore in a huge game for the champs to get their swagger all the way back. Special thanks to Derek Alvez and the Staten Island Advance for the used of their photos from the Iona/Farrell game. 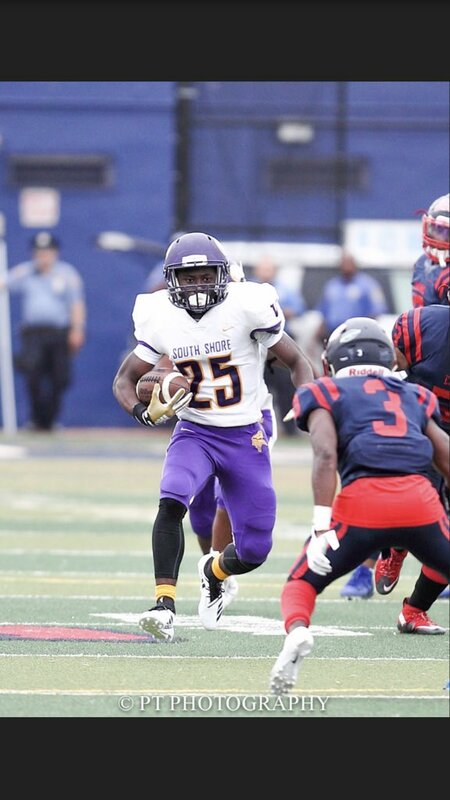 And, thanks to Pat Trani from South Shore High School for his photos from South Shore/Tottenville game.